Sally Ride and the research vessel that bears her name. Delivering on the late astronaut Sally Ride’s pioneering spirit, UC San Diego today announced the official launch of Sally Ride Science at UC San Diego with a slate of summer workshops in science, technology, engineering, art and math, or STEAM, aimed at young women in middle school and high school. The program is the result of a partnership agreement between UC San Diego and Sally Ride Science, an education company that Ride and her longtime partner, Tam O'Shaughnessy co-founded with three friends in 2001. Ride, who was the first American woman in space, and the other founders were committed to expanding educational opportunities in the sciences, especially for girls and young women. The goal of the new partnership is to continue and expand that important mission. 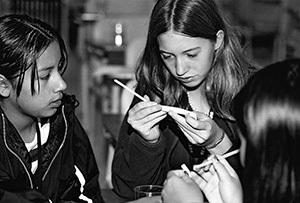 The Sally Ride Science Junior Academy, which is aimed at students in grades 6 through 12, is a unique partnership between UC San Diego Extension, the San Diego Supercomputer Center and Scripps Institution of Oceanography, with each entity helping to shape and develop the innovative weeklong summer workshops. Offerings include a variety of STEAM courses where students will immerse themselves in hands-on projects, assuming the roles of a geophysicist, ocean engineer, computer scientist and beyond. Top-notch STEAM instructors will lead these workshops, serving both as teachers and role models. The workshops also will incorporate real-life stories of vibrant individuals conducting research in each discipline with the goal of inspiring students to pursue careers in STEAM fields. Workshop topics include the science of earthquakes, space exploration, oceanography, robotics, 3D modeling and video game programming. There will be three weeks of one-week workshops, running from July 11 through July 29. The cost for a half-day camp is $150 and a full day is $250. If a student signs up for the full three weeks, it will cost $695. The focus of the workshops is based in part on Sally Ride Science’s successful program and book series “Cool Careers in STEM,” which detail a world of possibilities in a wide variety of fields including engineering, biotechnology and earth sciences. Karen Flammer, co-founder of Sally Ride Science and its current director of education, said the workshops are designed to inspire more girls and young women to pursue careers in STEAM fields to help close an ongoing gender gap. Currently, women receive 57 percent of all of the bachelor of science degrees awarded, but they are woefully underrepresented in such areas as computer science, where they represent only 18 percent of the degrees awarded, as well as in engineering and physics, where they represent just 19 percent of the degrees awarded in each of those fields. In addition to the summer courses, Sally Ride Science at UC San Diego is debuting its new online video series The Constellation: Sally Ride Science Conversations. The series will feature interviews with highly accomplished women throughout the UC System in science, technology, engineering and math fields for The STEAM Channel on UCTV, which UC San Diego Extension oversees. The first segment premieres on March 1 and spotlights Margaret Leinen, vice chancellor for marine sciences and the director of Scripps Institution of Oceanography, in conversation with Flammer, who was also recently named the new director of education at the San Diego Supercomputer Center. O’Shaughnessy, who serves as executive director of Sally Ride Science at UC San Diego, said the launch of the summer workshop series is just the first phase of an ambitious plan to offer a full suite of STEAM programs, including expanded summer workshops and other courses as well as professional development for teachers to arm them with the latest in STEAM instruction techniques. In addition, Scripps Institution of Oceanography is preparing for the summer 2016 arrival of America’s newest oceanographic research vessel: R/V Sally Ride. Under construction now by the U.S. Navy, the ship was christened Sally Ride by Secretary of the Navy Ray Mabus in honor of Sally Ride’s remarkable legacy of scientific accomplishment, technical achievement, space exploration and commitment to science education. The state-of-the-art ship will use powerful sensors to conduct multidisciplinary scientific research worldwide, from coastlines to continental shelves to the deepest trenches, and will investigate the workings within, upon and above Earth’s oceans. Using satellite telepresence, students and teachers will experience ocean exploration while interacting with scientists at sea. R/V Sally Ride will provide an exciting new venue for Sally Ride Science at UC San Diego to demonstrate to students that STEAM fields are meaningful, satisfying and accessible for everyone.